Click here for awesome video of Ken Stotz’ record run. The 1/8th mile is what Stotz racing has concentrated on this year. It really showed at the NHDRO national finals in Indianapolis sponsored by DME Racing/Pro-Stock Inc. The incrementals were “1.12-60ft, 2.88-330ft, 4.34-1/8th mile and 6.77-1/4 mile. Those are personal bests for Stotz Racing and the 2.88 and 4.34 are record breaking! This makes 5 Races-5 Finals with 2 wins. If we can keep this pace up next year it would surely lead to a Fifth National Championship in 2018 which is our goal to start with. 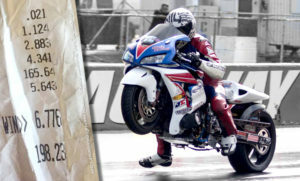 The Honda CBR 1000rr is once again the worlds quickest street bike! The NHDRO race in Indianapolis this weekend was forecast for the beautiful weather right up until we got there on Friday. Friday’s test session had great weather and we got to test the new Maxx-Race ECU. The Race combines everything they had on the V-1 with the expander box in one small ECU. In all my years of racing, have never had an ECU that was easy to navigate until the Maxx. Even wiring the bike was easy as all the wires have printing every 9 inches as to what they are for. Saturday’s weather dawned beautifully, but by the second round of qualifying, we heard rain was coming for Sunday and NHDRO might try and get one round of eliminations on Saturday night. The track was tight but we had some tuning issues getting the bike to move off the line. Going down track the bike ran like a bat out of hell. Shifting was seamless with the new Robinson 1-4 auto. Even fifth and sixth shifted smoothly requiring a very short kill time. No ProStreet eliminations occurred Saturday night. Sunday we woke up to light rain which eventually became heavier. NHDRO made the decision to finish the race during qualifying of the final race in Indy September 30-Oct. 1st. Hope we see you there. The attendance at the IMS Show in Chicago (Rosemont, IL) was much better than I have seen in years. The Stotz Racing Pro Street bike was the center attraction of Top Gear Powersports large booth. I was a guest speaker at the Progressive Insurance stage with Ricky Gadson’s presentation of 50 years of horsepower growth from 1967 to present. Honda was consistently at the forefront of the horsepower leaders and/or the “Fastest Bike on the Planet” leaders. My most vivid memory as a 9 year old kid was the cover of the magazines with the introduction of the 1969 cb750. Wow! Later when I was legally riding, the 6 cylinder CBX came out. Wow Again! I am in negotiations with the owner of the original CBX-Turbo that my friends at Mr. Turbo built. If I can get it and restore it I will have that for the shows also. Looks to be a great year. Stay tuned! With rain on and off all day Saturday the Lucas Oil Raceway crew and NHDRO staff rose another level trying to get the track dried so we can scream down the 1320. Luckily the rain held off just enough to get two of the three qualifiers in. We ran a 7.21@194 in the first qualifier just to see the bike get from point A to point B and check out track conditions just before the rain came. Amazingly the rain stopped just long enough to get the track dried off and another qualifier for all racers. We stepped it up by running a 7.11@ 196. attacking the eighth mile hard and turning the boost down on the big end to save wear and tear on the motor. We ended up #3 qualifier and were confident about eliminations on Sunday if the rain could hold off. Well low and behold mother nature heard all our prayers and sent the rain else where. In the first round of eliminations we were attacking half track hard and playing it safe out the back door for a 7.01@196 mph. Second round we stepped it up even more running 6.98@197 mph. This was our best numbers to half track. All we needed to do now was to put all the power down the entire 1320. We made a slight clutch change before the semi-final. Unfortunately our opponent and friendly rival Mark Paquette blew the oil filter off his bike in the burnout giving Frankie a bye win to the finals. We slowed to a 7.04@198 mph. The bike didn’t like the clutch change. We really had to step up our game to beat Bud Yoder in the finals. He was running record numbers all day. In the finals Frankie cut an awesome .020 light and peaked at a 6.95@201 but wasn’t enough for Yoder’s record tying 6.84@211 mph. Running our best 1/8 mile times to date we are certain this is just the beginning to an amazing season and next time we will prevail on top.